Here is another example of how a web application providing APIs for external programmers can bring out some very cool apps. Netflix subscribers will definitely appreciate this new mashup – Netflix InstantWatcher. If you watch a lot of ‘Watch instantly’ movies in your computer or in your TV through a Roku box, you will know how hard it is find the movies you like in Netflix. Netflix InstantWatcher uses Netflix APIs to pull the movies that are available for watching instantly and neatly categorizes them. The movies are categorized based on Genre and each genre is further cetagorized into narrower sections so you can drill down exactly to what kind of movie you feel like watching. It also displays the number of movies available in a specific genre. The movies are sorted by release date by default in a particular category and you can also sort by title, rating or expiration date. You also have an option to view in normal – text entry with easy to read aspects of a movie like rating, actors, etc., minimal and box art. Once you click on a movie title, you can instantly start watching the nmovie at Netflix by hitting the Play button. Or you can read the synopsis or look at similar movies available on Instant. 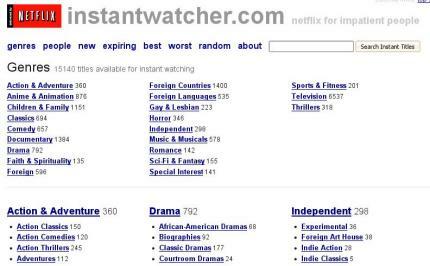 If all these weren’t enough, you can also browse movies by people, new, expiring, best, worst or just random if you are feeling lucky. Netflix Instant Watcher is a godsend mashup for those using this feature a lot. Even though the titles there are so limited, now you can atleast find the best ones in there easily. I will be hooking up Netflix shortly as soon as my free 3 month movie subscriptions with DirecTV expires. But, when I had Netflix, my wife and I had watched many Instant films in our laptop. And we’d absolutely be using this to find movies. If I could find a roku coupon, I may even go out and buy a Roku Netflix box or this LG Netflix streaming Blu-Ray player. Finally, make sure you are using your Netflix subscription to it’s fullest by checking out your usage patterns. It’s so funny you just wrote about this…Betsy & I just joined Netflix about a week ago, and I just found out yesterday that I can watch movies instantly via my XBox 360…so I did it! It was pretty sweet…it just streams it to your TV. The movie we watched was in HD & it was great. I’m getting THIS CLOSE to canceling my $85 Directv bill! Great Post! You have done a nice work. Thank you! I use alluc.org to watch movies online. Everything is free and they have lots of movies and tv series online. Really it is very useful and thanks for sharing it. I’ll have to give this a whirl this weekend, as I just re-activated my subscription. THanks for the heads-up.